Below are common attributes associated to Blue Pacific Juniper. Become a care taker for Blue Pacific Juniper! Below are member comments regarding how to plant Blue Pacific Juniper. No comments have been posted regarding how to plant Blue Pacific Juniper. Be the first! Do you know how to plant Blue Pacific Juniper? Below are member comments regarding how to prune Blue Pacific Juniper. No comments have been posted regarding how to prune Blue Pacific Juniper. Be the first! Do you know how to prune Blue Pacific Juniper? Below are member comments regarding how to fertilize Blue Pacific Juniper. 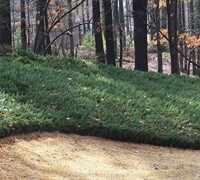 No comments have been posted regarding how to fertilize Blue Pacific Juniper. Be the first! Do you know how to fertlize and water Blue Pacific Juniper? Below are member comments regarding how to deal with Blue Pacific Juniper's pests and problems. No comments have been posted regarding how to deal with Blue Pacific Juniper's pests and problems. Be the first! Do you know how to deal with pests and problems with Blue Pacific Juniper? Looking for Blue Pacific Juniper? Get Blue Pacific Juniper fresh and large directly from the grower to your garden! Buy Blue Pacific Juniper online from the nursery wholesalers and save BIG! Junipers generally need no pruning, just cut away dead or unwanted branches. If you do need to cut it back wait until late winter before new growth emerges. Blue Pacific Junipers grow up to 12 feet wide at maturity. Keep this in mind when planting them near driveways, streets, and lawn areas, providing them room to grow, and you might never need to prune them! Blue Pacific Juniper is a very drought tolerant plant that should be planted in well-drained soil and in full sun. This juniper is great for use as a groundcover plant on steep slopes or as a wide border in landscape beds. To plant, dig a hole no deeper than the root ball and two to three times the width of the root ball and fill it with water. If the hole drains within a few hours, you have good drainage. If the water is still standing 12 hours later, improve the drainage in your bed, perhaps by establishing a raised bed. Turn and break up the soil removed from the planting hole. If the native soil is dense, compacted or heavy clay mix in a good organic compost or soil amendment at a 50/50 ratio with the soil removed from the hole. Remove your plant from its container and carefully but firmly loosen the root ball. Set the plant into the hole you've prepared, making sure the top of the root ball is slightly above the soil level. Pull your backfill soil mixture around the root ball in the hole, tamping as you go to remove air pockets. Then water thoroughly and cover with a one to two-inch layer of mulch. Feed Blue Pacific Juniper in spring with a slow-release shrub & tree type fertilizer that includes a micronutrient package. I've seen no serious pest or disease problems with Blue Pacific Juniper. Consistently wet soil can cause root rot.